When businesses fail to make a profit, they go out of business. Small, big, odd, old, no businesses can defy the possibility of closing up shop. Especially if they can’t become profitable after they start operation. At least, you might think they would have to be profitable. Not in “Bizarro World” where companies like WeWork can get valued on “spirituality,” and Elon Musk can joke about bankruptcy while never seeming able to get Tesla profitable. Even companies like Apple are pulling a “sleight of hand” by using repatriation funds to increase their market cap. 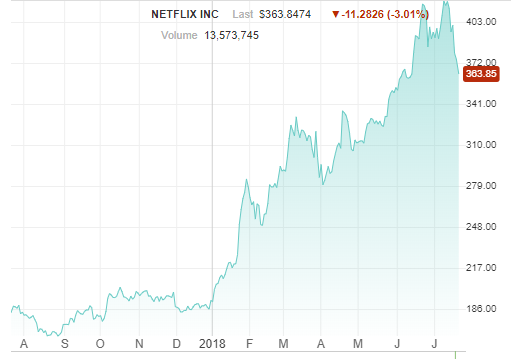 So, to be clear, “Bizarro World” is very real, and it’s the U.S.
One major company that is burning through cash like a dry mountain wildfire is Netflix. On the consumer side, everything appears to be great. This year their content was nominated for 112 Emmys. Pretty impressive, except they burned through $2.02 billion as of the end of 2017, according to their company reports. And they plan to torch another $3 to $4 billion in 2018, according to a report at Wolf Street. Now, you might be thinking this Olympic-sized burning of cash would trigger valuation concerns. And the problem isn’t that Netflix could succeed and justify this stock valuation at some point in the future. The problem is it’s being valued as though it’s 10 years down the road and has already succeeded. When your competitors are Google, Amazon, HBO, et. al, should your company stock be priced as though it’s beating the competition already? Netflix stock is. But this is a precarious place to be in. The stock is already on a downward slide due to recent quarterly reports of lackluster subscriber counts. Total subscribers came in at below the level that analysts had forecast… and the selling began almost immediately. In after-hours trading, the stock plummeted by more than $50, around 12%. But Netflix stock has done this before, this year in fact, and recovered by soaring even higher. Almost every bit of this “priced for perfection” corporate debt is being used to create award-winning “Netflix Exclusive” content to acquire subscribers. That might sound great on the surface, and even with the recent stock slide, investors still seem to be clamoring towards them. Media giants like Rupert Murdoch even closed up shop to “get out of their way,” according to The Economist. 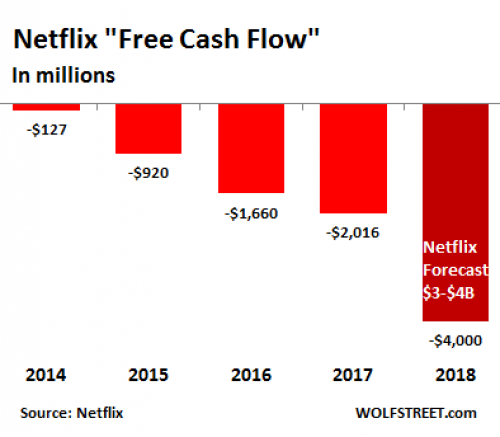 Yet Netflix “won’t be profitable for the foreseeable future” according to Motley Fool. And profitability is kind of the point of being in business. But they aren’t profitable, so there will be a big price to pay. But it doesn’t seem like Netflix or its corporate competitors will be footing the bill. In the real world, when you borrow money you have to pay it back, and with interest. Usually, you secure that loan with something. In Bizarro World, you can build a sky-high stock valuation based on a decent idea, and that gives you a “cushion” so you can keep borrowing. Like Netflix has. In other words, red ink seems to be trendy in 2018. Corporate debt keeps piling up, and some companies are playing shell games to keep “looking” profitable. But that profitability is an illusion. 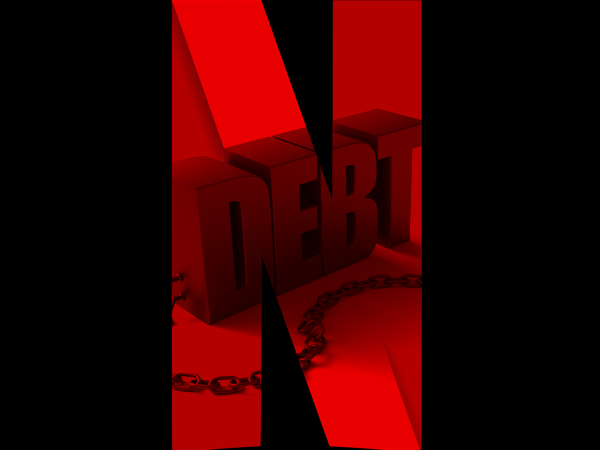 The market caps and inflated share prices are securing loan capital for companies like Netflix. Eventually, all of this piling corporate debt will need to be paid back. And the economy will suffer when the bill comes due because, barring a miracle, the debt will not be repaid. Elon Musk joked about this, but there’s truth in his joke. These massive debts could crush Tesla, Netflix, and many other publicly traded companies. Netflix might be creating award-winning content, but profitability is still far out of reach and their share price is still overinflated. Their junk-rated company “lives in a fantasy world” according to Wolf Richter. The corporate debt fantasy world will soon come to an end, so make sure you have some real-world crash-insurance to keep your portfolio stable.